Thanks to Dale Heaton handling her for me while we were on our vacation, Lily placed 1st in the Lone Star Region Amateur and qualified for Regionals. This is her first season and only fourth NSTRA trial. She had a 5/5 and scored a 961, so I've got my work cut out for me in Corsicana, TX this weekend!! Lily ran in the 18th brace on Saturday and got the 16th place qualifying her for Sunday's elimination round. She ran in the 3rd brace Sunday and found 4 birds, but my aim was off and I only knocked down 1 for her. It was enough for 5th place and she got a chance to run for the two top spots. 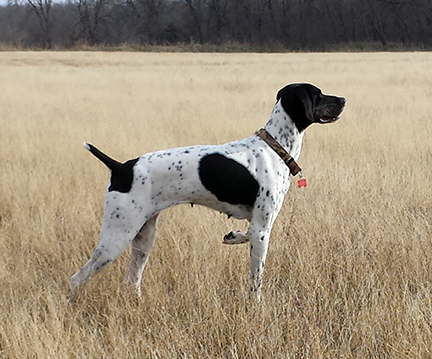 She ran for a 0 find in the 1st brace and we're still waiting on word of her final placement. We're proud of her Top 6 Regional placement in only her 5th NSTRA trial - she's proven that she's got what it takes to be competitive! !